The KPI Institute assists thousands of organizations each year in finding solutions to their performance needs. 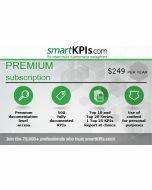 You can choose to access our body of knowledge either by subscribing to smartKPIs.com, our performance measurement integration platform, or by becoming a Member of The KPI Institute. Choose the best option for you from the Memberships category.